ST. JOHN’S, NL – The Atlantic Institute for Market Studies (AIMS) is pleased to announce the appointment of Ed Hollett as a senior research fellow with a focus on policy analysis, public affairs commentary and general outreach for Newfoundland and Labrador. Power said that the new position serves two purposes. It establishes an AIMS presence on the ground in Newfoundland and Labrador to better serve the needs of the province. At the same time, it gives AIMS the opportunity to bring the unique perspective of Newfoundlanders and Labradorians to a wider audience across Atlantic Canada and throughout the country. Marco Navarro-Génie, AIMS’s President and CEO, said that since its founding in 1994, AIMS has provided a distinct perspective on public policy issues facing Atlantic Canadians. The Institute publishes peer-reviewed policy studies, intended to inform policy makers and citizens. It also supports public discussion by publishing fact-based commentaries, having AIMS fellows appear on television and radio to discuss policy issues and hosting public events to disseminate its research. Historian Gerhard bassler's new book from Flanker examines efforts by the Government of Newfoundland to develop local industry by recruiting immigrants from Germany, Latvia, and Austria between 1950 and 1970. Based in large part on interviews Bassler conducted for other research on Germans in Newfoundland, this is a personal account of the men and women who came to Newfoundland and who, in many instances, stayed despite their initial impressions of the place and its people. Bassler documents each of the industries created and, as such, this is a welcome companion to Bassler's biography of the architect of the program - Alfred Valdmanis - as well as Doug Letto's Chocolate bars and rubber boots. Escape Hatch is available in book stores or online from Flanker. Perhaps one of the most disconcerting aspects of former Premier Paul Davis' testimony at the Barry Inquiry last week is the clear evidence that he still lacks a level-headed, rational perspective on the events of April 2015 and afterward. In response to questions, Davis said that "very quickly [after the shooting] there were rumours that I had ordered an assassination and that was a concern." As CBC noted in its story on Davis' testimony, Constable Joe Smyth earlier had testified he was concerned about the conspiracy theories bandied around on social media. One can only wonder why such lunatic ideas - obviously, insane notions unsupported by any evidence - would even cause Davis a second thought. Most people would dismiss them immediately for the idiotic drivel they are. But, by his own account, Davis gave them credibility and continues to do so. Last Saturday, this headline (left) in the Telegram prompted a storm of outrage from people who thought that it placed the blame for a sexual assault on the victim. The words were essentially what the victim had said during her testimony in the trial. They were also a more blunt version of what both the Telegram story and CBC's story said. 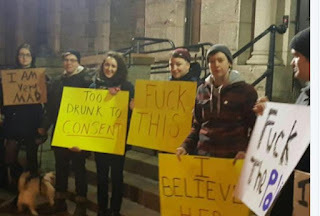 If the victim had been too drunk to recall details of what had happened the night of the assault, then logically she was too drunk to consent. The jury of five women and six men delivered their verdict Friday. They found accused attacker - a police officer, on duty at the time of the assault - to be not guilty of the assault. A group gathered on the steps of the courthouse on Friday night protesting the verdict. One of them carried a sign that was astonishing in light of the screams of outrage the week before at the Telegram headline. The sign read "Too drunk to consent." The headline and the subsequent controversy didn't have an impact on the verdict but the headline and the sign make an interesting contradiction. Everyone is entitled to them. Not every opinion, though, is equal in value or validity or, as former CBC boss Tony Manera showed recently, in veracity. Manera wrote an opinion column for the Ottawa Citizen that appeared on Thursday. He offered three changes to the constitution that he said would fittingly boost Canada's sovereignty in this the 150th anniversary of Confederation. Put it all in caps like that and you have a handy acronym that bureaucrats can type over and over again without getting tired. It's like the Government Renewal Initiative. Internal government documents quickly started referring to the GRI. And almost as quickly, the wags among the province's public servants started calling the regular meetings GRIM in their schedules. So Flatter, Leaner, Management Structure is FLMS. Most likely folks would pronounce that with an "I" in there to make it a word: FLIMS. Then the wags will add a "Y" on the end. There's your joke for the morning. Now let's look at Wednesday's announcements. Economist Stephen Gordon argues that "in Canada, the nationalism is as likely to form on the left as on the right." (National Post, 2017). What's more interesting, though, is that this might not make any difference when it comes to the political or policy consequences. Nationalism is deeply-rooted on the Canadian left, and it’s not hard to imagine scenarios where the nationalist challenge comes from there. Some elements in the nationalist left — Maude Barlow, for one — find themselves both agreeing with the nationalism of Donald Trump and trying to avoid being associated with him. This stance may be harder to sustain if the flow of immigrants — and especially unskilled immigrants — increased sharply. If suppressed national wages and increased national inequality is enough for you to reject trade, then it’s not clear why you’d accept an immigration policy that has the same effect. A dozen years ago, philosopher Joseph Heath argued that nationalism in Canada and the United States formed on opposite ends of the political spectrum (US = right. Canada = left). "The central barrier to increased political integration between Canada and the United States is that there is almost no policy overlap between nationalist groups in the two countries, and thus fewer projects that can motivate these groups to set aside national partiality in order to participate in a joint undertaking." "The events which [sic] occurred in the months leading up to Mr. Martin’s cessation of employment and which culminated in the wording in the Budget speech on April 14, 2016 and subsequent comments to the media by Government officials were tantamount to constructive dismissal." What's truly bizarre, though, is the behaviour Paddon considered to be harassment. Ches Crosbie announced last week he is going to take another shot at entering the family business. The son of former Mulroney cabinet minister John Crosbie will spend some time travelling the province, getting to know provincial Conservatives and building a campaign for the party leadership in Newfoundland and Labrador. Ches, whose grandfather was a delegate to the national convention, tried for a federal nomination for the 2015 election. The federal party rejected him, apparently because of some donations he'd made to the Liberal party federally. That's really no nevermind as Ches has as good a shot at anyone of taking the party leadership. If he did so, Ches also has a shot at succeeding his father and his great grandfather. They were both named John, both were cabinet ministers in St. John's and elder of the two Johns served briefly as Prime Minister of Newfoundland in 1918. The younger John wanted the job but never got it. Ches' launch last week was not accompanied by great hoopla but his media interviews were as polished as one might expect of a professional political family. Crosbie undoubtedly had some help in getting ready from veteran political consultant John Laschinger. He's an old family friend, having run John's campaign for the Tory leadership in the 1970s and later helped provincial Progressive Conservatives win general election after general election. Maybe the poor folks at CBC were just confused. Heaven knows it can be confusing with all the announcements of the hospital in Corner Brook since 2007. "Price tag missing," the headline screamed, "as Corner Brook hospital finally gets green light." The price tag should be missing because... wait for it... the government didn't give the hospital the green light. Read the very first sentence of the official news release. Sometimes you get the feeling that the newsrooms of the city are as divorced from reality as the earth is distant from the sun. Their almost exclusive stock-in-trade has become the reports of speeches, seminars, election campaigns, council meetings, legislative shenanigans, endless press releases… All that is planned news, programmed news, bloodless mimeographed news, which touches not at all on the endless swirl of the sometimes-grubby, sometimes-heartening day-to-day life in the streets outside. Erin Weir is the New Democrat member of parliament for Regina - Lewvan. There was the AbitibiBowater case where that company shut down its last pulp and paper mill in the province of Newfoundland and Labrador. The provincial government reclaimed water rights that it had given to AbitibiBowater to operate the mills, but then the company challenged Canada under NAFTA for the loss of its water rights, which it was no longer even using for the purpose they were intended. Well, the previous Conservative government paid AbitibiBowater $130 million to withdraw that NAFTA chapter 11 claim. Truth and something else was clearly in the atmosphere this week as the Telegram's Russell Wangersky offered a few thoughts on the subject in his Tuesday column. But if we reach a point where anything true can be discounted, and anything false can be announced as true, where do we go to ensure that we’re making the best decisions on everything from voting to retirement savings to whether our school system is working? "If we reach a point." As if in Newfoundland and Labrador, that point remains somewhere in the future. As if the point - where false is true and truth is not merely discounted but savagely attacked - was not already a receding dot in the rearview mirror. And, for the record, what Russell calls "the weakening, cash-strapped traditional media" played an essential role in pressing the heavy foot of government excess even harder on the accelerator in order to make the dot smaller. Trust is the foundation of any strong relationship. That's why a great many journalists, troubled at the decline of their industry, emphasise the importance of trust in re-establishing a solid relationship between the news media and the folks who used to be their captive market. In its 2016 survey on Canadians and trust, Environics found that 44% of respondents trust Canada's conventional news media as an industry. About 50% said that editorial content - either major conventional media or online news sites - was their first choice as a source of information. Fully 53% picked the websites of major conventional news media as their first choice for information online. Neither Canadians nor Americans are particularly inclined to trust social media. Pew found that only four percent of Americans trusted social media a lot. 30% trusted social media somewhat as a source of information. Environics found that 31% of Canadians used their Facebook news feed as the first, second, or third preferred source for current news. Only eight percent of that was as a first choice. Bloggers: 14% in total and only three percent as a first choice for current news. Conventional news media: 69% of Canadians want their news from them, with 38% ranking it as their first choice for current news. So there you have it, journalists. The numbers aren't directly comparable but there's enough pf a similarity to come to the conclusion that Captain Sweatpants is not eating your lunch on either side of the border. The numbers are so large they take your breath away. In a poll conducted for The Public Policy Forum for its recent report on Canadian news media, eight "out of 10 respondents said they actively follow the news (with education, not age, being the main determinant)." As pollster Allan Gregg noted in an article for Policy Options, 93% of respondents to that poll said people get "more news today, more quickly and frequently than we ever have in the past." And yet half of them had no idea that conventional media was facing a financial crisis so severe that many current media outlets are likely to vanish in the months and years ahead. Doesn't fit together. Doesn't make sense. You just can't have all those people wired in and miss a story that was quite literally in all the newspapers, on radio, and on television. Doesn't make sense unless people aren't paying as much attention as they say. MQO conducted a little poll in late January and found the party standings among voters remains where it was in November. Nothing has happened in the past few months to move support for either of the three parties in the province up or down. We are in the lull before the provincial budget coming in March or April. That lull isn't happening by accident. The Liberals retreated last summer in the face of massive public rejection of their spring budget. Since then the ruling Liberals have been virtually silent, cancelling planned budget cuts and other measures to cope with the government's financial crisis. That silence resulted in a very slow climb in Liberal support from a low of 17% in May 2016 to about 27% of all respondents by the fall. But look at the Conservative number. It's basically the same as the Liberal one, given that the margin of error for the poll is plus or minus four percentage points. ISER Books and the Queen Elizabeth II Library will hold a panel discussion on the recent ISER publication Sweat Equity: Cooperative House Building in Newfoundland 1920-1974. Authors Chris Sharpe and Jo Shawyer will be joined by panelists Kim Blanchard, Stephen Jewczyk, and Jeff Webb to discuss the book, cooperative housing in Newfoundland, and current housing issues affecting the province. Admission is free and they've got snacks and refreshments. When: Wednesday, February 15th at 3:30pm. CBC aired the first of three half hour programs on Monday night featuring a bunch of teachers talking about problems in the Newfoundland and Labrador school system. The rest will come along over the next couple of weeks. To be perfectly clear, CBC claims ownership of the programs but, by the looks of things, CBC had very little to do with the program content, at least in the first one. The provincial teachers union picked the people to appear and covered their travel, meals, and accommodations for one Saturday to record the three 30-minute programs. It's an absolute fascinating insight into how news media have changed in a very short space of time. Canadian writer J.J. McCullough used a column in the Washington Post last week to ask a very useful question: why it is that the progressive society in Quebec produces "so many massacres"? Regular readers will recognise this question from SRBP last week. McCullough also noted that Canadian conventional media are looking for familiar narratives in which to frame the story. That basically fits with the stimulus for last week's post, namely Neil McDonald's trite opinion column on the shooting that framed the story in the context of Donald Trump's islamophobia. In a 2006 essay, Globe and Mail columnist Jan Wong posited a theory that Quebec’s various lone nuts, many of whom were not of pure French-Canadian stock, were predictably alienated from a province that places such a high premium on cultural conformity. She was denounced by a unanimous vote in the Canadian Parliament and sank into a career-ruining depression. The current events magazine Maclean’s ran a cover story in 2010 arguing that Quebec, where old-fashioned mafia collusion between government contractors, unions and politicians is still common, was easily “the most corrupt province in Canada.” That, too, was denounced by a unanimous vote of Parliament. The people of Gambo held their first mummers' parade the December before last. The Gander Beacon, the weekly newspaper that covers events in Gambo, featured some pictures of the parade and a write-up on it. The town's recreation director organised the event and the handful of people who took part in the parade wound up at the local senior citizens home. Gambo. First mummers' parade, ever, in 2015. Wonderful stuff, but awfully queer given that mummering or jannying is an incredibly old tradition among Europeans in Newfoundland and Labrador that only died down in the second half of the last century. People did all sorts of things and called it mummering. In the version most would know, people would dress up in various costumes and go door-to-door in the community. More often than not, they'd be invited in for some refreshments in exchange for music and dancing and the chance to try and guess the identity of the costumed revellers. People settled in Gambo about 1857. David Smallwood, grandfather of the former premier, set up a lumbering business and sawmill at the southwestern end of Bonavista Bay around 1860. In other words, Gambo is a place where mummering ought to be well-known. The provincial New Democratic Party boss is rightly getting raked over the political coals for his Twitter comment that Prime Minister Justin Trudeau "sent a rookie woman minister" to announce that the government had abandoned plans for changing the way Canadians go to the polls. The hyper-partisan attack by McCurdy and other New Democrats on Trudeau isn't about the issue itself. New Democrats know as well as Liberals that no one in Canada gives a rat's behind about changing the way we vote from first-past-the-post to something else. That's why the Liberals shelved the plan. Few people turned up at the hearings. Not many sent in comments on the initiative. Canadians don't care. In the House of Commons, members can put questions to cabinet ministers several ways. One of them is called Questions on the Order Paper. Ask a sensible question. Get a sensible answer. This is a truly amazing idea given that the House of Assembly got rid of the notion 20 years ago. Actually telling people something useful instead other uncommunication that remains all the rage in provincial government circles. Bloc Quebecois member of parliament Marilene Gill put a Question on the Order Paper about Muskrat Falls and the recent federal loan guarantee for $2.9 billion. Here are the questions from Gill and the answers from natural resources minister Jim Carr. Note the underlined bits for anyone not aware of this information. Born and raised in Venezuela, Andreas Miguel Rondon is an economist who now lives in Madrid. He wrote for The Washington Post last week on the lesson Americans should learn from the Venezuelan experience with Hugo Chavez. Trump may be a capitalist and Chavez may have been a socialist but the populist formula remains the same. Not so simple, but worth considering no matter where or when you encounter a populist politician.